This trend is evident in the city’s two highest growing mixed-used development nodes, namely Century City and the V&A Waterfront, positioning themselves accordingly with a focus on offering superior amenities and security in a controlled environment. Two new office blocks are currently under construction at the entrance of the V&A Waterfront along Dock Road, with one building set to become the new office of British American Tabacco (BAT) South Africa. The company will be relocating from their current premises in Stellenbosch after 25 years, with Atterbury Property having assisted with the move to the new development in this landmark location. The new BAT offices are due to be completed in November 2016. PWC signed a 9 000m² lease in the newly redeveloped Silo precinct. Silo No. 5 is expected to be completed by mid-2016, and will add 13 000m² of premium grade office space. The building will be equipped with a number of client meeting rooms, state-of the-art training room facilities and a client entertainment area on the roof terrace. With a focus on active lifestyle, the building is set to have multiple change rooms and shower facilities to encourage tenants to take full advantage of the lifestyle amenities and new trial routes offered by the V&A Waterfront. Apart from the residential developments and the new Silo hotel by the Royal Portfolio, Silo No 4 will also house South Africa’s premier Virgin Active Health Club. Read more about the Silo District here. Werksmans Attorneys will also be moving from their current location in the CBD to the Silo District in the Waterfront. The Cape Town City Centre has changed quite significantly in the last year alone. The unprecedented demand for residential property in Cape Town CBD and surrounding suburbs is responsible for the majority of new development in Cape Town’s city centre and conversions from offices to apartments. More and more Capetonians are trading in their suburban homes for more compact and convenient apartments or homes in the city or Atlantic Seaboard, taking full advantage of the Mother City’s amenities and significantly shorter commutes to and from work. Read more about residential conversions here. There is a new financial district appearing in the Northerly edge of the CBD, with Portside and soon to be completed Touchstone House attracting international tenants such as EXL and China Construction Bank. Read more about Cape Town’s new financial district here. Construction has commenced on KPMG Place by Durban-based property developer FWJK. KPMG is set to relocate their entire operation from the MSC Building, and will be taking approximately 7,000m² of the 19,000m² available in this new development. Most noticeable from the elevated highway is the extension underway to the Cape Town International Convention Centre (CTICC) – set to become the home of the new Christian Barnard Memorial hospital and brand new Virgin Active Health Club. The development is set to be completed in December 2016. The recent completion of the new E-TV building just off Roeland Street will soon be occupied by the German consulate and E-TV when they move from their existing property in Long Kloof Studios. Woodstock has shown significant interest from both prospective tenants and investors during 2015, with some substantial projects in the pipeline for 2016. Woodstock has already seen the establishment of The Boulevard Office Park which fronts onto Eastern Boulevard having proven popular among the likes of Medscheme, Alexander Forbes, Swiss RE, BDO and Zurich. A new mixed-use development “The Iron Works” is currently being constructed in Upper Woodstock, comprising one level of ground floor retail, 3 levels of parking, one level of offices, and 4 levels of residential apartments. Century City is perceived to be the Mother City’s fastest growing business node – just 14 minutes away from the Cape Town City Bowl via the N1 highway. 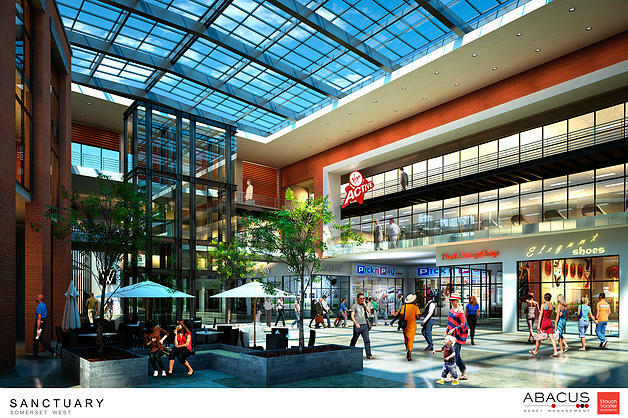 The lifestyle benefits offered by Century City have convinced the likes of Absa Barclays and Thompsons Reuters to position themselves in the newly developed Bridgeways Precinct (to be completed next month). Absa Barclays have confirmed 14 000m2, and will join the likes of Liberty, Chevron, Vodacom, MTN and IBM as major companies operating in Century City. Apart from the lifestyle benefits offered to employees, this new development in Cape Town presents good value for money in terms rentals on premium office space, competitive parking ratios and high speed internet infrastructure. Read more about Century City and its lifestyle benefits here. The new development trend continues in Claremont, where construction is underway on Citadel Place situated adjacent to popular shopping mall Cavendish Square. The property will be the new home of Citidel Wealth Management. The development is set to be completed mid-2016. Other significant refurbishments include Grove Exchange in Claremont and Great Westerford in Newlands. Cape Town is one of the most popular tourist destinations in South Africa, resulting in a total of R3.5bn planned for new hotels in Cape Town over the next four years.